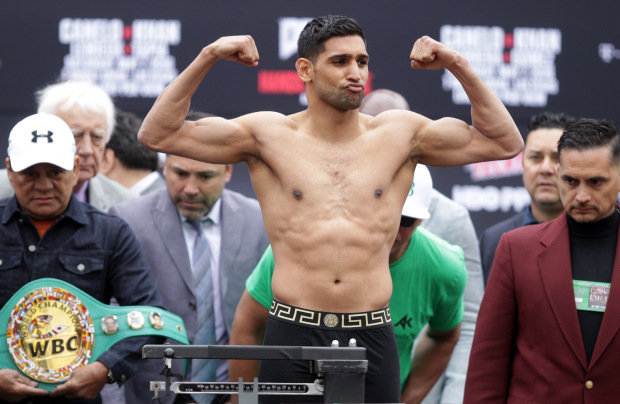 Former welterweight world champion Amir Khan will end a near two year hiatus from the sport with about in Liverpool on April 21 against an unnamed opponent he announced on Wednesday. The 31-year-old — whose most recent activity was spent on a reality TV programme in the jungle — made the announcement alongside British boxing promoter Eddie Hearn with whom he has signed a three-fight deal. The 2004 Olympic lightweight silver medalist’s last outing was back in May 2016 when he stepped up to middleweight to face Mexico’s star pugilist Saul ‘Canelo’ Alvarez and was knocked out in the sixth round. Khan said his ambition is to taste what it is like to be world champion again having been the unified welterweight world champion — holding the WBA belt from 2009-12 and the IBF version in 2011. “I’m determined to win another World Championship and I’m confident I’ve got the right team behind me to help me do so,” said Khan at a press conference in London. Hearn said it was great to have Khan back fighting in England — his last fight on home turf was beating Julio Diaz in 2013 — and pledged to bring him top names as opponents. “The plan is to box in April and then again in August or September in preparation for a super fight in Winter 2018,” said Hearn. “The target is to provide him with the biggest fights possible with a mouth-watering list of names including the likes of Manny Pacquiao, Kell Brook, Keith Thurman and Errol Spence.